I love Saturdays around here. Right now. In the blistering hot summer days of the Lowcountry. Oh yes...I do love our Saturdays. We literally jump out of bed and head out for the farmers market first thing in the morning. Some times we are a bit more tired than others (depending on the festivities of the night before), and can't decide whether we are ready for breakfast or brunch. But that's ok. It's summer. Bountiful. The choices are enough to make our head spin. Simplicity is key: we nibble on radishes dipped in a bit of salt, some tomatoes rubbed on thick pieces of bread. A handful of warm olives and soft boiled eggs. Big chunks of watermelon just as juicy as the sun ripened peaches we get every week. Promises of grilled corn and freshly caught fish for dinner. It's easy to forget the heat in those instances. We did just that the other day as soon as we felt a breeze coming in. A sure sign of a storm later on in the afternoon. 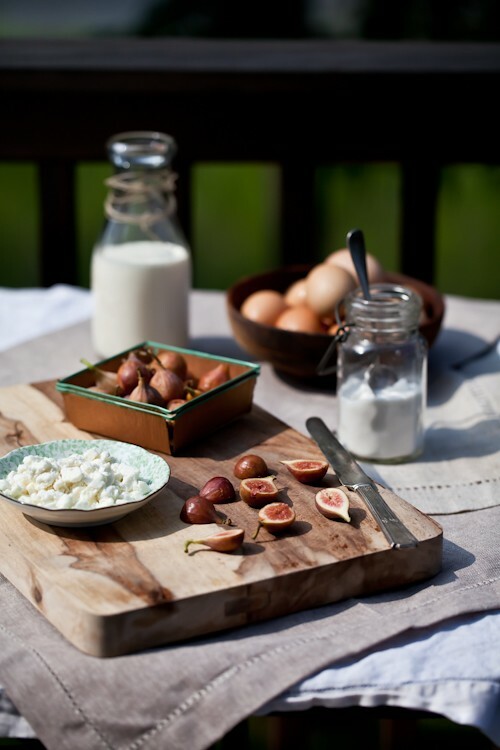 We snacked on fresh figs and fresh goat cheese, fresh eggs scrambled with some chives from the garden and big mugs of coffee. Our pups decided to have a barking session with the neighbors' pets, cats included and within minutes we were down by the marsh making afternoon boating and late dinner plans with them. I really love where we live. So easy going and laid back. Reminds me a lot of summers back home. The sound of doors swinging open and kids running out. Free. Loud. My mom's tabouli salad with tons of mint, oilve oil and lemon juice. I felt my heart nagging at me when I called home the other day and my brother was heading to the chalet where we'd spend our summers. I could taste the camp fires, the dives in the river and the hikes up our favorite trails. Filled me with serenity and the strong desire to keep on building my own new memories and trails here. Miles and years away. I find it a bit harder here where people are constantly on the move but it seems that our street has finally found stability again. The group has changed a bit and that's a good thing. New faces, new stories, new opinions. Same kindness and desire to share which fits right in with the old team. So you see, it's not unusual to wave people over for a nibble and to have them stay the day. When that happens I like to have something easy to whip up and serve for dinner and one of the recipes that often comes to my mind is custard. Creme brulee, creme caramels, pots de creme...things like that. This time though I went and dug out one of my all time favorite cookbook for a something new: Sweet Seasons by Richard Leach. Seasons oriented cookbooks are not "news" but his book is the first one that stuck such a strong cord with me. A perfect mix of simple flavors and recipes with more high end ones. No matter which core recipe you settle for, you can pick one, more or none of the elements around it. This is the only cookbook that I have used from page one til the end. There is absolutely zero flaw in the recipes, explanations and techniques. I had ear marked Chef Leach's recipe for Mascarpone and Goat Cheese Custard with Fresh Berries moons ago and you guessed it, never got around to make it until this past Saturday. We were nibbling on goat cheese and fresh figs when the proverbial light bulb came upon me and I remembered the recipe in Sweet Seasons, promptly removed the goat cheese plate from under B. 's nose and headed to the kitchen. Goat Cheese Custards With Figs & Balsamic Syrup, (custard recipe adapted from Sweet Seasons by Richard Leach). The custards are a breeze to prepare and you could substitute cream cheese instead of mascarpone if you needed to. These are best prepared a couple of hours in advance and can be kept in the fridge for up to 3 days. pate brisee or gluten free tart dough. In a large mixing bowl, whisk together the cheeses, honey and lemon zest until smooth. Add the eggs, egg white and heavy cream and whisk until smooth. This is best done by hand so you don't incorporate too much air in the batter which would make your custard rise, fall and crack. Roll the pastry dough to about 1/8 - inch thick and cut eight 3.5-inch disks from it. Place the 8 disks on a parchment paper lined baking sheet. Gently indedt a 3-inch metal ring into each disk but without cutting through. This will form a seal between the baking sheet and the custard and provide a bit of a crunch when you eat the custards. If this step is too time consuming, simply bake the custards in ramekins. Bake the disks with the rings for about 20 minutes and allow to cool before filling. Lower the oven temperature to 250F. Fill the rings to about 3/4 full with the cheese custard and bake for about 30 minutes or until the filling seems set (should not wiggle anymore). Let cool and run a knife inside the rings to release the custards. Refrigerate until ready to serve. Put the vinegar and honey in a medium, heavy bottomed saucepan and bring to a strong simmer over high heat. Turn the heat down to medium and let the vinegar reduce by half or until thick enough to coat the back of a spoon. Keep warm. 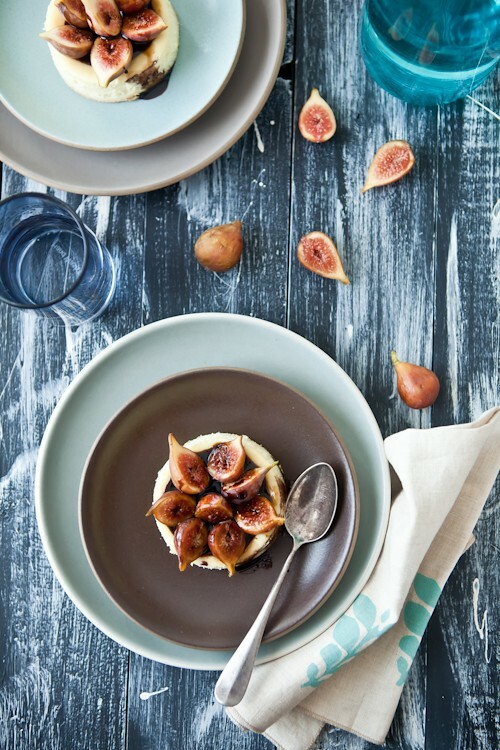 To serve, place cut figs (either halved or quartered depending on the size) and drizzle with balsamic syrup. - vintage strawberry short baskets from Sadie Olive on etsy. This custard looks absolutely stunning, and I bet it tastes just as wonderful. Gorgeous photos. Thank you for sharing the recipe! I LOVE fresh figs. But where we live in the country I can't find them without going an hour or more away. So I decided to try my hand at growing them. The plants are almost 2 feet tall now and I'm excited at what the first harvest will bring. these look very nice, sort of a small tart, without the sides. Syrup elegant touch. I really enjoy "Sweet Seasons" as well. We're using it as our textbook in the Plated Desserts Class at the Culinary Institute of Charleston and it's definitely one I'll be using again and again in the future! Oh, these look delicious! I'm just willlld about goat cheese -- I would love every bite of one of these custards! Oh, I'm so jealous that you live in such a wonderful, laid-back, and friendly community! I totally wish that I could just call people over for dinner at the drop of a hat. 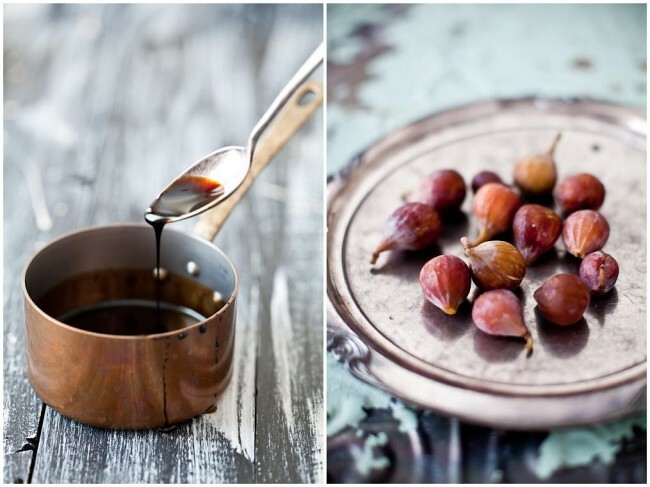 These custards look fantastic--I love the combination of balsamic vinegar and fruit. And the blue styling: to die for! Where did you get the blue botanical silkscreened tea towel from? I remember seeing it on a design blog a little while back but now that I really want to pick one up, I can't find the link! Oh how I adore figs! Great tart, love figs and I'm swimming in them these days. By the way, since you mentioned Tabouli.. is your mom of Lebanese decent? I want to make these SO badly!!! And your photography is stunning. I'm a huge fan of figs, goats cheese and balsamic so this is right up my alley. Can't wait to make it. Love your photos - having just got my first SLR and now having played around with photographing food I have an appreciation of just how hard it is. That looks wonderful. I love the combo of goat cheese and figs. 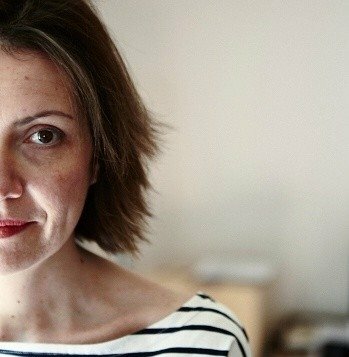 J'ai la meme petite casserole en cuivre que toi mais j'en prends pas d'aussi belle photos. Btw, quand j'etait en France j'ai montre les photos de ton site a mon frere (qui est un tres bon photographe) et puis il etait tres impressione! Fig and goat cheese such a great combination. I've seen the first signs of figs at Trader Joe's. I can't wait till they are in full swing. I wonder if this pairing would work as an ice cream. I think I might test it out. I just was looking for toppings for my goat yogurt. Fresh figs, honey and balsamic. Perfect! As I was looking over the blog titles of every one I follow.... I read this blog title and with it came some of my favorite words of all time! My mouth waters at the combination of figs and goat cheese! YUM! Thanks for sharing and I love your blog! Maddy: I added a short list of props at the end of the post after your comment. They are from Jewelweeds on etsy. That is a smakker variety of figs than the ones we have here. I love goat's cheese and paired with fresh figs and balsamic reduction, it can only be good!!! The pictures are so beautiful. We have some white figs tree at the village and we love to eat them as plain as fresh. But I'm wondering if you have an easy recipe to bake these sweet white figs. Thank you. Fabulous looking tarts! And a wonderful grouping of flavours. I was wondering about the quality of the balsamic vinegar you used. Would supermarket quality be okay, seeing as you are adding quite a bit of honey? Oh, I can't wait for Summer and all the luscious fruits again. This looks so amazing that I want some now. It would make the perfect breakfast. pas tout lu, mais les photos parlent d'elles-même !!!! Figs are popping up in my farmers market too - lots of the green ones though, which I never remember the name for... And though I'm not a huge custard fan, figs with balsamic over vanilla ice cream is perfection at the end of a hot day. These are lovely. I have some figs waiting to go into preserves, but I could be easily persuaded to make this. This post was quite a treat :) We wake up early on Saturdays (no matter what) and walk over to our local farmers market as well. It's nice getting there while some vendors are still setting up. We fill our bags. Walk to the bakery for some fresh cake donuts and then a final trip to the coffee vendor right on the corner before making our way back home. After fortifying ourselves we walk back out to the local deli were we pick up freshly baked baguettes and a small tub of olives. The sun is bright. We sweat profusely. Summer. 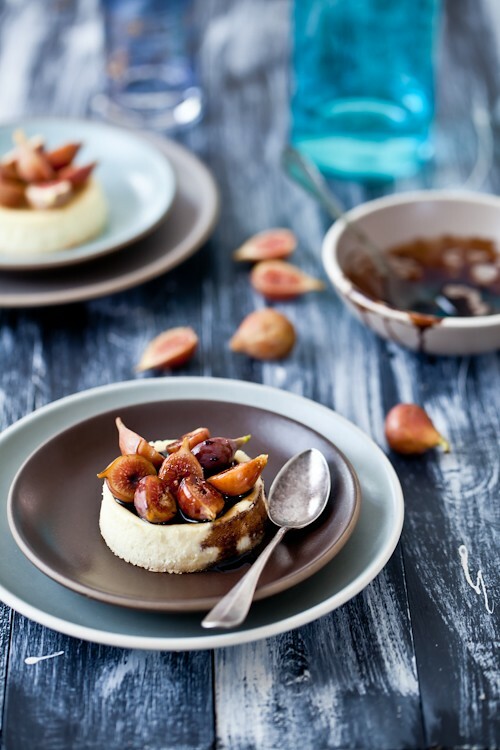 Helen, I love figs and can't wait for them to be in season here - this is such a fabulous dessert! It looks beautiful! Figs have never been easy to find in Denver so I would normally just look at your beautiful photos and appreciate them for your artistic talent. But always surprising me with foods I never expected is my nearest Costco and so I have a BIG box of figs and now need to utilize them in different ways. I love the combination of goat cheese and fruit so this not only looks but sounds delicious too! Random thought...the cookie my parents would buy when we were kids that I just hated; the Fig Newton...wondering if my opinion of it would change at all now that my tastes have? Anita: no but her and my dad were born in Morocco in the 30s and 40s. They did live in Lebanon, Algeria, Congo, Nigeria as kids and young adults (not together) as my grandfathers were military men. Thea: 1/3 cup of honey to 1 cup vinegar is about 1/2 of that recipes suggest actually so I toned it down a lot already but you do need this much sugar to turn it into a syrup. I used store bought - medium priced vinegar. Not the cheap kind but not the gourmet kind either. Mallory: except for the second photo I shoot indoors. My studio is orientated south west, with 3 large windows. One behind me and my shooting area is next to the 2 others so I can decide to shoot with back light or from either side. I am there most of the time from 8am to 6pm depending on the work load and I have 2 large scrims to cover the windows if necessary as well as fill cards and reflectors if I need. this dish is so simple yet stunning. Gorgeous! The combination of flavors sound so delicious. I love how the seasons and places we've been inspire! Your post always makes me so hungry and I believe that to be the highest compliment!!!! I want to live inside every one of your photos. Just gorgeous. I love all things goat cheese, so this is now on the list of recipes to be made. Can't wait!! Really unusual, gorgeous pics, as ever. What a great association! Goat cheese is really good, how is the American cheese compared to the French "chèvre"? What a wonderful image of Saturdays you have painted! I was actually just writing a post about our Saturday peach picking ritual. We also find ourselves jumping out of bed to head to the market, though sometimes grudgingly after a late night. I have been making your rhubarb custards over and over again (with different fruits), but these are the perfect change of pace. I have been looking for a goat cheesecake like dish. - is the cooking time the same if you use ramekins? should the tops be firm (non-wiggly) when they are done still? - I love the wood background on this photos! Dark backgrounds add so much drama. Is it a table or some boards that you painted yourself? Mallory: they are called saw horses. No, no! I am extremely proud to call it work. It is hard work but it is the most rewarding work I have done. I visited California in mid-June and that was the first time I experienced figs that weren't in a fig newton. I fell in love! And I thought it was absolutely delicious with goat cheese. Now having returned to the East coast, I haven't been able to find them. I checked a farmer's market and I had no luck, and I've yet to find them in a grocery store. Any suggestions? Paula: no not really beside telling you to keep looking. The season extends until September sometimes. You never know. Some regions or cities don't see them at all. It all depend on the economics of demand and supply I guess. I second the question about baking the custards directly in the ramekins-- just bake at 250F for 30 minutes? Can't wait to make these this weekend! Michelle: I have not made them in ramekins but I personally would do the same time and temperature. Lovely Saturday story with delicious looking custard. Thanks for the cookbook recommendation, too. I love reading new things. This is a beautiful presentation, and your photographs are gorgeous. I love fresh figs, and pairing them with balsamic sounds like a wonderful flavor combination! What a unique and delicious looking dessert. I admit I haven't been very adventurous with custards (eating or making) beyond cream pies, but this has inspired me to try! As always, beautiful. And, I am sure, delicious! Your pictures are so beautiful, as always. Oh my! The combination of those three cheeses makes me want to run out to the store right now...but it's nap time and the two little ones are finally asleep! So I will have to settle on feasting with my eyes from these lovely photos! I hear you on the lazy days of summer...I live in cottage country, all year round. Summer's are especially busy with weekenders and I just love the smell of all those campfires and the sound of kids squealing. It's just awesome. 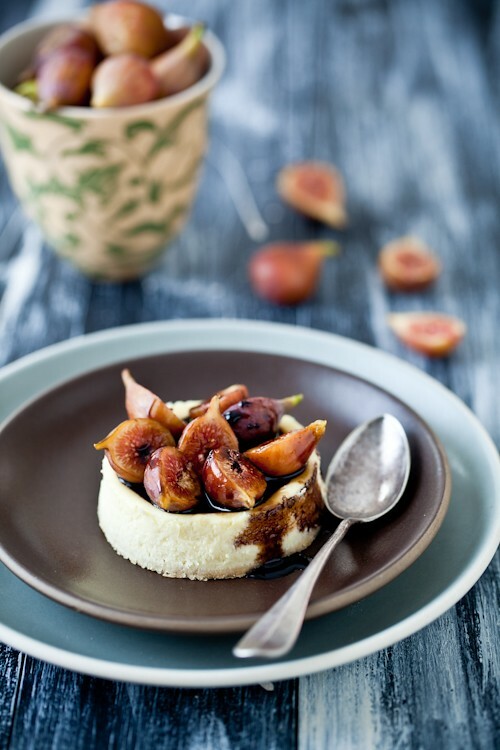 I've never been a fig-gal, but this recipe just might make a convert out of me! 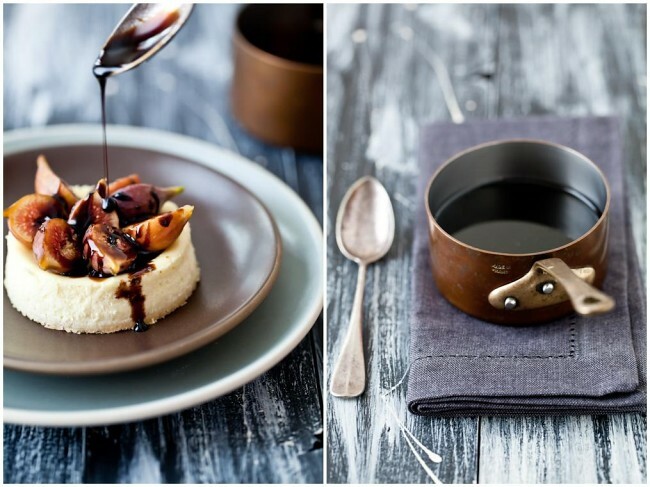 These dishes look absolutely devine! Thank you for the glamazing photography! I'm going to try this for our wine tasting group... I'm on dessert and wanted to make something a little different. I will have to use the ramekins since I don't have the rings but still want the extra crunch the pastry crust provides. What do you think about layering the custard on crust before serving? PS your photos are amazing! Oh how I adore your blog, I always get so Inspired !! Delicious images.. I am not sure if I'd rather dig in with a fork or plunge myself into it! Thank you for the reminder of Martha's Chocolate and Hazelnut Meringue Cake! I had forgotten where I read about it and now you brought it back up again. Gen: the goat cheese I get at tje farmers market is really really close to the ones I'd get back home. Gabi: I got to Lowes and get long pieces of wood that my husband cuts to my specs and I stain, age or distress them. I also use a long plan (nothing cut) that I have stained while on one sire and brown wood on the other side. oh boy, goat cheese custard. I'm in love! Manger La Ville: that was apparently a senior moment. Thanks for catching it! Amazing combination of flavours and textures!! Really loved it! wow, I'm absolutely in awe of your photos, and your cooking, simply amazing! Your pot is getting a nice patina too, lovely! Does it make any difference having it polished or not, I've been wondering? I have a couple of Mauviel pots, and wanna get some more soon, its such beautiful cookware.